Kuroshima Research Station holds scientific research, exhibition, guided tours, and accept internships. These activities are in effort to share new findings from our research. Kuroshima Research Station has been conducting various studies on sea turtles since 1978. 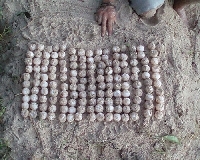 For example, number of eggs spawned at Kuroshima and Iriomote island has been recorded. The same research had been performed at Nishinohama beach of Kuroshima island for almost 40 years, making it the longest sea turtle research ever conducted in Okinawa. 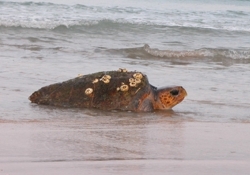 In addition, sea turtles had been tagged and released to study marine ecosystem. Stranded sea turtles, sea turtles washed ashore dead, are investigated to hypothesize the cause of death and precautions are taken to prevent another misfortune. We have been undertaking projects requested by Ministry of Environment and Okinawa prefectural government. 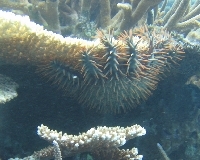 “The Distribution Research of Acanthaster (sea star) and Madrepores (coral) in the Sekisei Lagoon ,” commissioned by the city of Taketomi, was conducted in 1983. 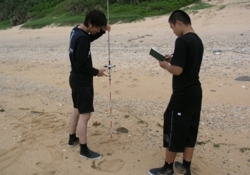 Another research commissioned by the Ministry of Environment, “The Coral Reef Monitoring Research in Yaeyama Islands,” was also practiced. 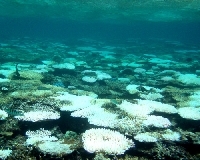 In addition, research of coral bleaching and assemblage was performed under the same commission. 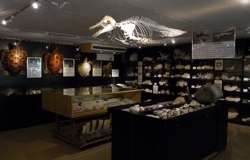 One of the best collections of coral reef specimens is stored at the station. Nature and culture change with time. 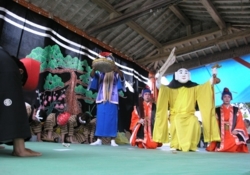 Our station keeps track of animals and traditional events at Kuroshima. Those documents become valuable information not only for our station but also for researchers from other institutions visiting the site. 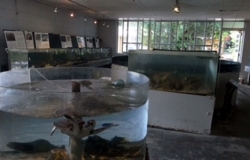 Our station has two exhibition rooms; one is museum-like exhibition and another is aquarium or zoo-like exhibition. Both exhibitions are available to the public. 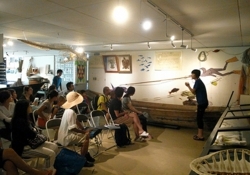 Museum-like exhibition room displays various objects such as stuffed sea turtles, shell and coral specimens, traditional boats (Haryu-sen), cultural tools, and a fragment of H2A rocket. In the aquarium like exhibition, animals which can be seen at Kuroshima island; sea turtles, habu (poisonous snake), coconut crab, fishes from coral reef are being cultivated. We accept internships or students training to become a museum curator. Students, or students taking years off from education, are allowed to stay at the station to learn the daily service as a staff. 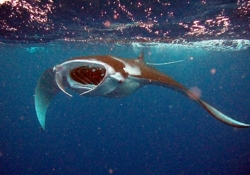 Skills of manners, document making, fieldwork, specimen making and managing, and other official staff work can be mastered through the program.